In 1631, when Mumtaz Mahal, the wife of India's Shah Jahan, died in childbirth, her griefstricken husband erected what may be the most beautiful building in the world, the Taj Mahal, as a mausoleum and memorial for her. Crafted from shimmering white marble that changes aspect at differing hours of the day, domed, minareted, the Taj has inspired the awe of generations of travelers, writers and artists and is the reason for most visits to Agra, if not to India itself. A structure like this one throws down a nearly unmeetable challenge to any architect contemplating building in its shadow. But when the Oberoi Group, which owns and operates luxury hotels in Asia, Australia and Africa, asked the Bombay-based architect Prabhat Patki, along with the Malaysian firm Lim, Teo + Wilkes Design Works, to build a new hotel on a site about six hundred yards from the Taj, the challenge proved irresistible. 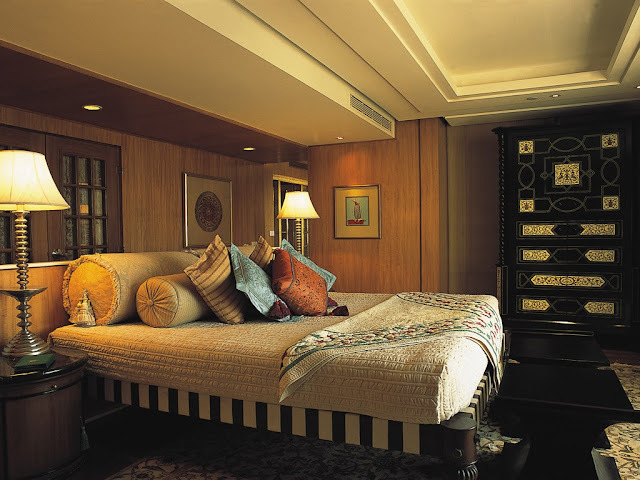 Patki's brief was to create a haven for guests that would embody the exotic grandeur of the monuments they have come to Agra to see and at the same time enfold them in luxury and serenity. 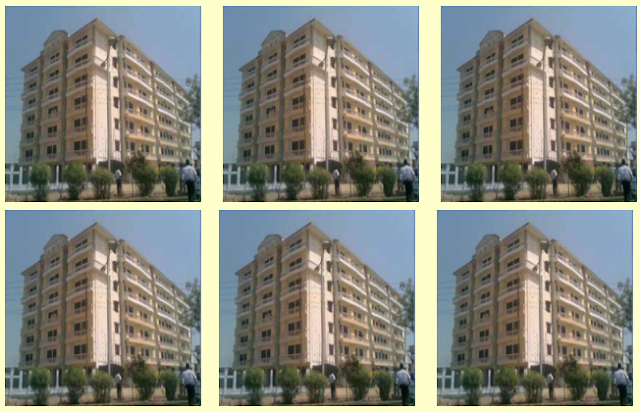 All this while respecting complex zoning and design regulations imposed by Amarvilas's unmatchable location. "We had to be very careful in our design style," says Patki, whose previous work for Oberoi included the opulent Rajvilas hotel just outside Jaipur "Putting a contemporary building so close to the Taj would have had severe heritage re-percussions, but traditional Indian style would have competed with it, so we opted for a variant of traditional design—Asian in content, but with Indian accents." The size and siting were also issues: Regulations forbid building higher than the domes of the Taj, so in order to achieve the desired room count, he designed setbacks that allowed for guest room terraces on three levels, and he staggered interior corridors, creating octagonal lobbies to break up their length. And since the master plan called for each of the 112 guest rooms and suites to have a view of the Taj Mahal, says Patki, "we had to stretch the whole hotel lengthwise along the plot." But he avoided monolithic monotony by placing rooms in two wings, accented by Ottoman-style bays and setting the building behind a colonnaded forecourt paved with traditional glass tiles and enlivened by frescoes painted with ground-semiprecious-stone pigments and gold leaf, in the Mughal style. The result looks like a palace in a Mughal miniature, and guests could be forgiven if they felt they'd found themselves in an Indian fairy tale. 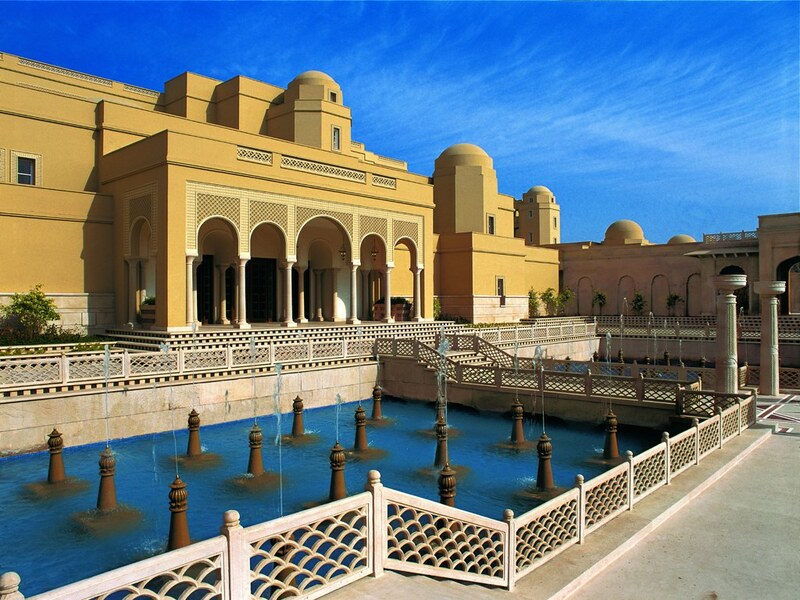 Passing into the forecourt of the ceremonial entrance pavilion, they encounter fountains, filigreed stone bridges and tall pillars topped by torches; the lobby has a geometrically painted dome, a tiled floor and huge arched windows that frame a breathtaking vista of the Taj. 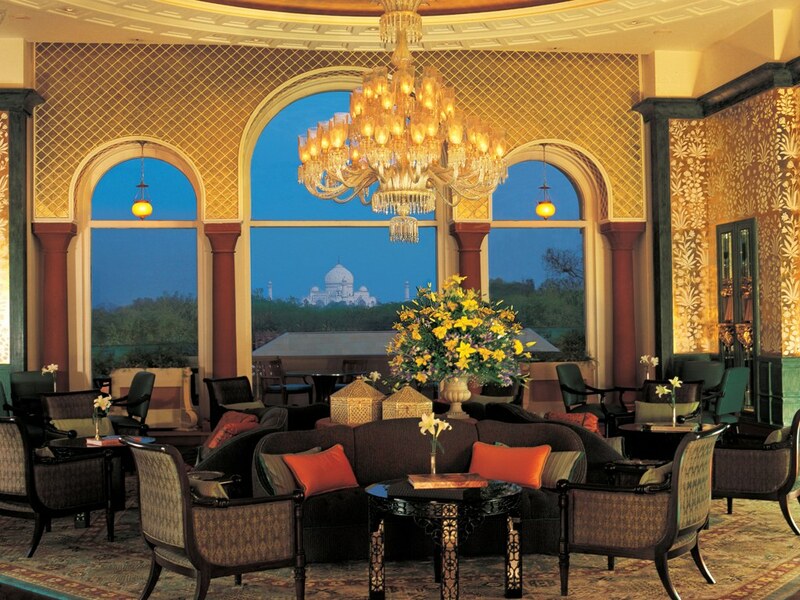 Flanking the windows are a teak-paneled bar dominated by an antique map of the Taj Mahal and an elegant French-influenced tea lounge. Even the restaurants—the all-day Bellevue, with its hip Asian-Mediterranean fusion cuisine, and the more formal Esphahan, which serves signature Indian dishes—seem to tell a story about themselves and the people in them. Throughout Amarvilas, the traditional crafts and materials that are a hallmark of the Oberoi style lighten the grandeur of chandeliers and opulent furnishings. 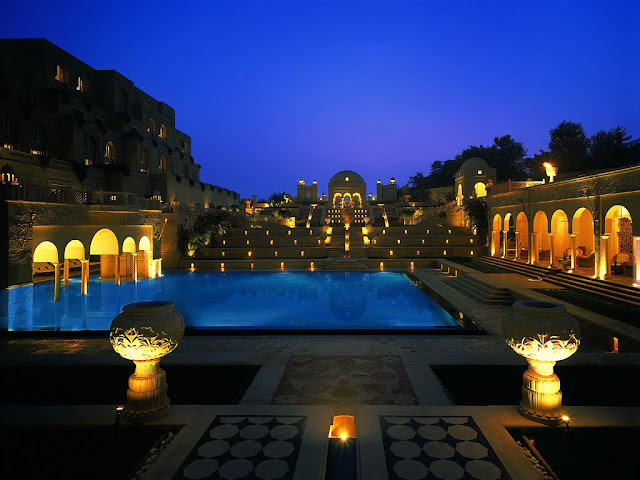 Creamy sandstone walls are frescoed or finished with a lime plaster; teak paneling, hand-knotted silk rugs and block-printed draperies soften the contours; the swimming pool is recessed into a terraced garden; guest rooms and suites are furnished with custom-built pieces and handwoven fabrics. Modern technology underlies Amarvilas's spa. Traditionally crafted iron gates, latticed windows and inlaid-stone floors are complemented by mosaic-lined whirlpool tubs, sauna and steam rooms and therapy suites, where Ayurvedic and antistress massages and skin treatments are available. After a day of such pampering, guests should be ready for a full dose of sight-seeing. In-room guides to Agra's monuments are only the beginning: The hotel will provide golf carts for the journey to the Taj, anits fleet of vintage automobiles is available for transport to any of the other attractions in the area. These include the Red Fort, the lacy stonework of Itmad-ud-Daulah's tomb and—beyond Agra—the wildlife and bird sanctuaries at Bharatpur and the Chambal ravines, as well as the deserted city of Fatehpur Sikri.